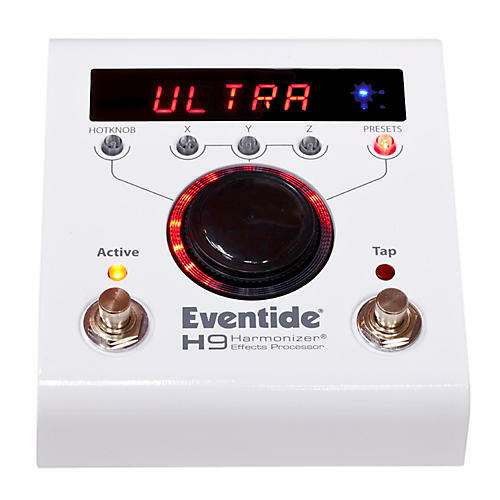 The award-winning H9 delivers Eventide's acclaimed sound and can run all of Eventide's stompbox effects. The H9 features a simple, one-knob user interface which allows easy Effect Editing and Preset Selection. Two onboard Footswitches let you change Presets, Tap Tempo, and Bypass with your feet during live performance. While the H9 is fully controllable via its front panel, a free editor/librarian, H9 Control, can be downloaded to your Mac, PC, or iOS device. Use the H9 Control app for live editing, creating and managing presets, and changing system settings. H9 even connects via Bluetooth to iPods, iPhones and iPads for wireless live control. The H9 features stereo audio I/O, MIDI I/O, Expression Pedal, and Auxiliary Switch inputs.